After going through a bad divorce and a failed suicide attempt, Ben tries to set his life straight as he falls for the woman who was almost his sister. Relationships can be difficult. When they end, it is easy to feel lost and hopeless. At least that's the case when it comes to Ben, played by Thomas Middleditch. He is a newly divorced man who has also recently tried to take his own life. He is depressed and feels like his entire existence is in shambles, one could even say its entangled. Ben is on a mission to try and find the one moment where it all went wrong. One day, Ben learns his parents adopted a child right before becoming pregnant with him. They had to return this kid when they found out they were pregnant because apparently, babies have a 30-day return policy. He believes he has finally found the exact point where his life went wrong, and oddly enough, it happened before he was even born. He believes finding this adopted child is just what he needs to fix his life. He seeks out his almost-sister and the two hit it off swimmingly. Joining Middleditch are Jess Weixler, Diana Bang, and Johannah Newmarch, who play three of the most influential women in Ben's life. Director Jason James and writer Jason Filiatrault have created an original, heartfelt, darkly humorous film in "Entanglement." In some ways, it is a dark romantic dramedy, but it also has surreal elements that add interesting depth to the story. It has discussions about how things often appear oddly connected in a world that can sometimes feel like little more than random chaos. Thomas Middleditch is brilliant here, and we think this is the best performance of his career. Though his character is a bit of a depressed sad sack, he still offers up quite a few laughs with his sarcastic brand of comedy. He also gets a few more dramatic and touching moments where he really gets to shine. Jess Weixler is also perfect as Hanna, Ben's almost adopted sister. She's super quirky and really mysterious. As soon as she shows up on screen, we wondered what he true intentions were with Ben. She's not so mischevious that we are critical of her or hate her, but we always had our guard up about her, especially since Ben's life was effectively in her hands as someone who has already attempted suicide once. Together, they are a dynamic duo. We haven't seen Diana Bang in any projects before, but she does a great job as Tabby, Ben's next door neighbor who clearly has a crush on him. She sneaks around his apartment when he's not there, cleaning it and rearranging it just to be a little bit closer to him. We were really pulled in by the story of Ben and Hanna, and Ben and Tabby, and Ben and his parents. At first, it seemed like a formulaic romance, but it morphs into something entirely different, something we absolutely adored. From time to time, there are quirky moments that we first thought were simple artistic expressions, like the filmmaker was trying to pull off a Wes Anderson-type of vibe, but these moments turn out to have a real purpose come movie's end. 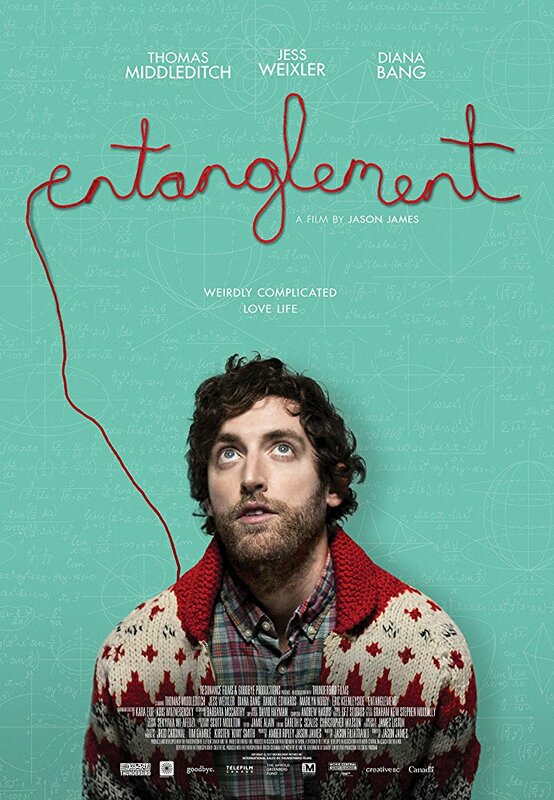 We can only hope "Entanglement" pops up on VOD or on one of the big streaming services soon because it is definitely worth checking out. We had a blast with this movie and it was one of the best things we saw at the San Diego International Film Festival.